Fahrenheit 9/11, the controversial film by Michael Moore, has been given a standing ovation by at the headquarters of the Academy Awards. The anti-Iraq war film was shown at the Academy of Motion Picture Arts and Sciences in Los Angeles on Tuesday. The 600-strong audience cheered and clapped throughout the film and got to their feet as Moore took to the stage. Fahrenheit 9/11, which won the top prize at the 2004 Cannes Film Festival, will open in US cinemas on 25 June. Moore, whose film criticises President Bush's response to the 11 September attacks and alleges links between the Bush family and Osama bin Laden's, told the audience it was time for change. He said: "There has been a shift in this country. ... The average American is finally beginning to figure it out. We were duped [into invading Iraq]." "I hope this country will be back in our hands in a short period of time," he added. Fahrenheit 9/11 was refused distribution by the film's original backers, Disney - whose Miramax film unit produced the movie - citing concerns over its apparent political bias. But brothers Harvey and Bob Weinstein, the founders of Miramax, personally bought back the rights from parent company Disney. 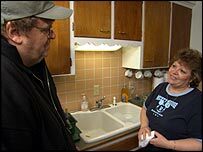 Moore won an Oscar in 2002 documentary Bowling for Columbine. He said he expected Fahrenheit 9/11 to do three times as well as Columbine, which earned a record $21.5m (£11.75m) for a documentary. Have you seen Fahrenheit 9/11?